The abdomen (tummy) is the part of the body in both men and women with the biggest room to accommodate fat. Not only is a big tummy due to fat accumulation not socially appealing, it is also not good for one’s health, especially for the heart and the blood vessels. Nobody was born with a fat-stuffed big tummy. That big tummy came about through years of careless lifestyle behaviour: from eating whatever came across as food through taking all sorts of alcoholic and non-alcoholic drinks to a very sedentary life (no form of exercise whatsoever). So it is very unrealistic when people with big tummies assume or believe they can burn all those fat overnight and wake up with a flat one or six packs in the morning; more unrealistic is when some of these people think one drug, be it a herbal tea or a tablet medication (mind you such drugs could be very harmful to your body), will shrink all those fat even without them modifying what and how they eat and without any form of exercise. The truth is that big tummy didn’t come overnight and cannot become flat overnight. It will take many months of dedicated effort in changing both your mindset and lifestyle behaviour to go from a fat-laden big tummy to a lean flat tummy. Make no mistake, there is no single all-conclusive formula of routines or programs for losing abdominal fat. What are discussed below are more of effective guidelines and frameworks that will help you, provided you’re willing to make the sacrifices and dedicate yourself, to shed those tummy fats over months. If you can afford it, consult a certified human nutritionist or dietician to help you plan your eating for the next one month based on locally available foods, taking into consideration the objective you have set out to achieve: to lose belly fat. Stick to this eating plan faithfully for one month after which you come back to review the outcome with the nutritionist or dietician for the continuation of the plan the next month. If you can’t afford a nutritionist, you can create a healthy eating plan yourself. Get a diary, you can call it healthy eating diary, and draw a weekly timetable of the foods you’re going to eat. In this weekly plan, ensure you eat more of low-carbohydrate, high-protein foods like beans, lean meat like the intestine, fish, vegetables, fruits. Cut down significantly the quantity of fufu, garri or yam you eat in a week. Having a healthy eating plan also means you greatly reduce or entirely stop taking sugary drinks and alcohol; avoid processed/canned foods (fish, beans, rice and so on) because they are heavily stuffed with sugar, bad fat and salt. Eating healthy to burn abdominal fat doesn’t mean avoiding fat in your food. It is more of avoiding bad fat (from animals known as saturated fat) and going for good fat (from plants known as unsaturated fat). Good fat sources include palm oil and vegetable cooking oil which you should cook your food with. Plus, it is more advisable to cut down more of carbohydrate-rich foods than foods rich in good fat because the human body burns fat for energy generation when there’s a limited supply of carbohydrate which is the first source of energy production. 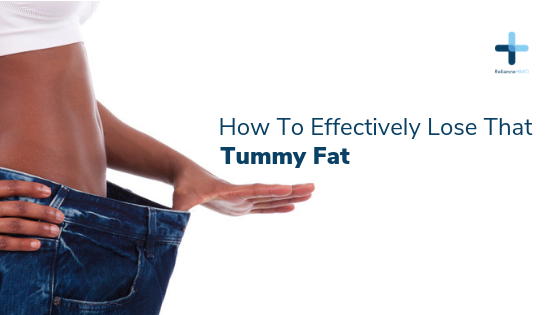 This means a gradual shedding of those accumulated tummy fat over time of reduced carbohydrate supply. And don’t forget to drink enough water. In fact, it should be the only drink in your life if possible. Drink enough water. Drink enough water. Again, drink enough water. A healthy eating plan doesn’t mean you should kill yourself when you fail to stick to all of a day’s eating routine for instance, by taking a sugary drink, an alcoholic drink or eating some burger. When this happens, note it down in your diary and move on with a mindset to do better next time while working towards the bigger picture: eating healthy to a flat tummy. Creating and following a healthy eating plan will be a waste of time and resources if you don’t exercise in your journey to lose that belly fat. Exercise is very key towards losing body fat and building a fit body. Again, if you can afford it, you can look out for and register with gyms staffed with certified fitness trainers who are experienced in designing exercise programs tailored to losing belly fat. These programs incorporate aerobic exercise activities like cycling and treadmill running with strength training programs like weight lifting because as you burn fat, it is important you grow some lean muscle. If you can’t afford the gym, you can always exercise in your neighbourhood. Make it a routine to wake up early in the morning to jog for at least 30 minutes at least 3 times a week. There are a whole bunch of other home-based exercises you can do such as push-ups, sit-ups, planking: you should Google these for a detailed explanation. The important thing here is to also create a weekly plan for these exercise activities and as much as possible to follow them. If there are friends in your circle with a similar burning desire to lose abdominal fat, you can come together and create an exercise group to collectively motivate one another towards pushing forward in making the required sacrifices to burn those belly fats. And how do you measure progress? Don’t rely on the weighing scale. Why? As you exercise and lose body fat, you also gain lean muscle mass meaning your weight may not significantly come down. To know you’re actually making progress, focus on how your trousers or skirts fit around your waistline as the months go by while working towards a flat tummy. You will find out that they are becoming looser, meaning you may need a tailor to slim-fit them or get smaller sized ones. Great news. The healthy waistline measurement target is anything less than 40 inches in men and less than 35 inches in women. So your trousers or skirts should naturally fit into these sizes. If what you wear is bigger, you need to start working towards reducing your belly fat to save your heart and blood vessels from possible future problems. And please, don’t stop living a healthy lifestyle once you hit the target of losing those tummy fats. Healthy eating and exercise should become a lifelong attitude for everyone.